The next day cream the starter with the water for the recipe, then add in the toasted sesame oil. Lightly dust your counter or work space with flour and scrape the dough out. With lightly floured hands, give the dough a stretch and fold and repeat. 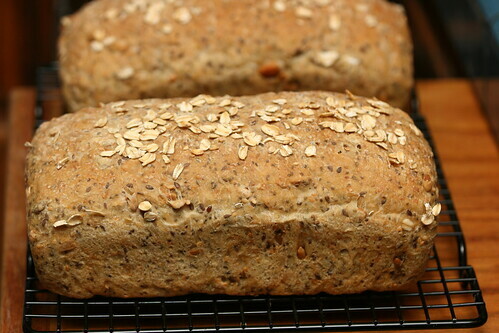 I made these particular loaves in loaf pans, which I did because I needed bread for sandwiches, however I think because of the large quantity of seeds it might work best with the support of a loaf pan. 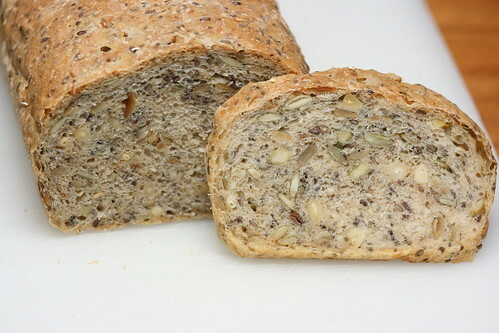 Lightly oil 2 9×5 inch loaf pans, flatten the dough into a rectangle and then roll it up tightly. 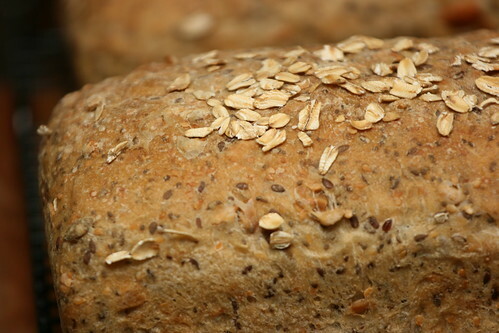 Tuck the ends under slightly and then roll it on the bench for a few seconds to even the loaf out and then place it seam side down in the loaf pan. Leave the loaves, covered, to proof, for me this was about an hour to an hour and a half. When the oven is preheated put the loaf pans in and set a timer for 20 minutes. At 20 minutes turn the loaves 180 degrees and swap their position in the oven, do this again 20 minutes later. Continue baking for another 10-20 minutes until the loaves sound hollow on the bottom, then remove to a cooling rack for at least 1 hour before cutting. Out of failure… comes deliciousness. 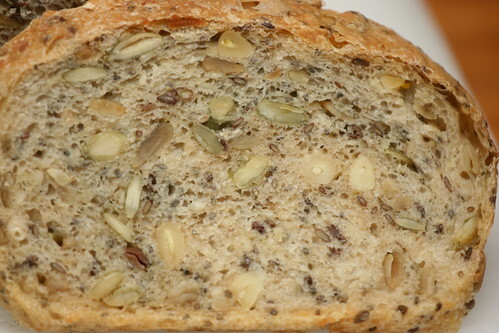 This bread is incredibly nutty, well, that should really be obvious. But it is. So, this is this week’s submission to YeastSpotting, which I give hearty thanks to for the hard work put into it, and the constant inspiration from all the participants!